Below are links to the free Math Games on this site. Play these games online anytime with no restrictions. For more types of games, see the Free Brain Games menu above and at right. Math games include favorites like sudoku, Brain Racer, KenKen, Nim Game, Tower Blaster, and more. Problem-solving math games train brain skills like logical reasoning, quantitative reasoning, and arithmetic. 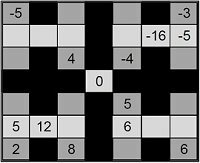 For a list of multiplication-related games (a subset of the above), see the Math Multiplication Games page. Math students who would like to test their memory of the 12 x 12 multiplication table may enjoy my 12 x 12 Time Multiplication Exam. The exam takes 3 minutes, and you'll see your score at the end. Looking for more free brain games? Go to the Full List of Games or choose a different games category from the list at right. All the online games are free to play as much as you want. No logging in, no registering. Just go to the game page and start playing!